The folks at Caelo Software, makers of some excellent tools for organizing your Outlook email, are at it again with Track Your Sent. Unlike the company's NEO Pro, Track Your Sent is not an overall email organizer. Instead, it takes aim at a narrow part of your email experience: the messages you send. Although plenty of email utilities help bring order to your inbox, your sent items folder is often overlooked, left to drown under the weight of its own unorganized mess. Not anymore. Track Your Sent adds a button that appears on all new messages you create, allowing you to set its category and folder before sending it. Still, it took me some time to warm up to Track Your Sent, a process that wasn't helped by the utility's unwieldy name. Based on its moniker, I expected this to be a utility that would allow you to find out when your sent messages were read. Instead, it's something more far-reaching and useful: an automated way to file and take action on messages that you send in Outlook. Once you've installed utility, you can set its default actions for all messages that you send. The first two options are "File to Folder" and "Add Category"; here you can set a default folder and category for all messages sent, or you can set it to "Ask," which means you'll get prompted to make a choice every time you send a message. Yes, every time--something that gets old quickly. Unfortunately, you can't customize these categories.You can't addi messages to a select recipient to a certain folder, while putting messages to another person in another location, for example. But Track Your Sent does add a button that appears on all new messages you create, allowing you to set its category and folder before sending it. In addition to filing and categorizing sent emails, Track Your Sent also allows you to create calendar entries and tasks from messages you sent. These features are an all-or-nothing sort of thing, though, as you can only enable this option for every message you send. Again, here it would be nice to be able to customize this setting a bit, so you only created calendar entries and tasks when you really needed to. Track Your Sent does include an option for dealing with messages that you reply to or forward. Its "Maintain Categories" option keeps you categories consistent, and stores them locally, so they're never revealed to your message's recipient. While Track Your Sent could benefit from more customization options, it will help folks who rely heavily on Outlook email to manage to-do lists and their daily lives. Note: The Download button takes you to the vendor's site, where you can download the latest version of the software appropriate to your version of Outlook. 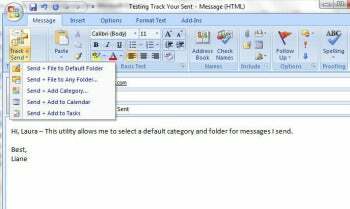 Bring order to your Outlook outbox with Caelo Software's Track Your Sent.